Jimmy Weldon turns 95 this year. He was born in 1923, the year that the original Yankee Stadium was constructed, the Warner Brothers Studios was created, and the world’s first portable radio was developed in America. In the 1940s, he served as a combat engineer in World War II under General George Patton. After returning home from the war, he got a job on the airwaves as a radio show host for four years. 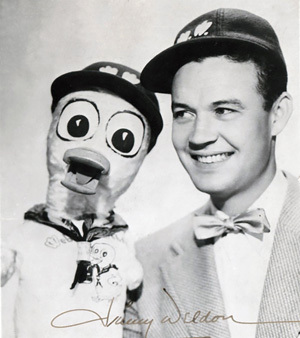 From there he moved on in the 1950s to help usher in the age of television with his own TV show, The Webster Webfoot Show. And that was just the start of an acting career that has now spanned over 60 years. As an actor, Jimmy has appeared on numerous TV series including The Waltons, The Rockford Files, and Dallas in addition to his voice-over skills in a host of cartoons such as Tom and Jerry Kids Show, Richie Rich and Scooby Doo to name but a few. But the voice he is probably most remembered for is that of the beloved Yakky Doodle. Little Yakky Doodle is a yellow duckling who lives with his best friend Chopper the bulldog. Yakky is frequently threatened by either Fibber Fox or Alfy Gator but Chopper defends his little buddy fiercely. Yakky debuted on the “Gone to the Ducks,” “Yuk Yuk Duck” and “Let’s the Duck Out” episodes of Augie Doggie and Doggie Daddy segments of The Quick Draw McGraw Show. Later in 1961, Yakky had his own segment on The Yogi Bear Show and also appeared in the episode “Live and Lion” of the animated series Snagglepuss. As the last surviving member of the Hanna Barbera Yogi Bear cartoon from the 1960s, Jimmy delights in keeping the memory of Yakky and Yakky’s famous line: “Will you be my mama?” alive. If you haven’t had the pleasure to meet Jimmy in person, then watch this video interview with Jimmy telling the story of Yakky Doodle. After more than six decades on the airwaves, small screen and stage, Jimmy shows no signs of slowing down. As such, he is a regular performer on the L. Ron Hubbard Theatre stage and can be heard on many of the Stories from the Golden Age audiobooks. Through these performances, Jimmy became familiar with L. Ron Hubbard’s fiction writing of the ’30s and ’40s, during the heyday of the pulp fiction era. 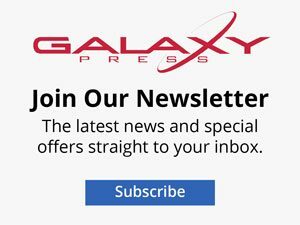 These short stories offer a glimpse back and a snapshot of America and the world peopled with heroes from all walks of life, from the detective on the mean streets to the armed forces fighting for rights and freedom of all. In these tales, Jimmy recognized the common thread of morality and goodness which they purvey. 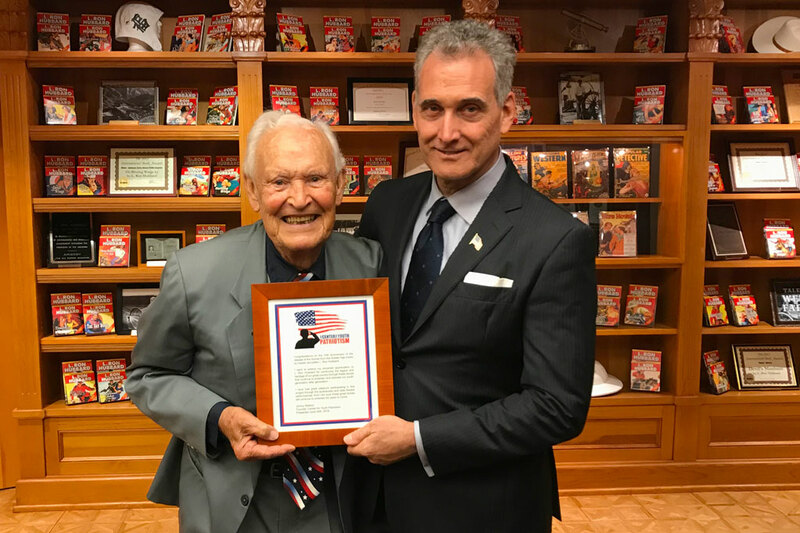 In recognition and celebration of the 10th anniversary of the release of L. Ron Hubbard’s Stories from the Golden Age series, Jimmy presented this plaque at the L. Ron Hubbard Library. Visit Center for Youth Patriotism here to find out more about Jimmy’s programs and to see how you can help. And may God bless America and citizens like Jimmy Weldon.